This is Posh manager Graham Westley's reaction at the final whistle at Chesterfield. Photo: Joe Dent/theposh.com. Peterborough United manager Graham Westley was full of praise for his ‘fantastic’ players after a dramatic 1-0 League One win at Chesterfield today (February 6). Debutant Tom Nichols scored the only goal of the game 10 minutes into the second-half, but his dream start in Posh colours was overshadowed by a tremendous rearguard action after defenders Michael Smith and Ricardo Santos were sent off. This header from Posh striker Lee Angol ended up in the back of the net, but he was ruled offside. Photo: Joe Dent/theposh.com. Including added time at the end of the game, Posh played for almost 40 minutes with 10 men and almost 20 minutes with nine men, but they refused to be beaten. The win, a first in four League One matches, moved Posh up two places to eighth. They remain three points off the play-off places. Westley was thrilled to see the Posh promotion push get back on track despite little going right for his side towards the end. “That was a real gutsy, back-to-the-walls effort for the final 30 minutes or so,” Westley enthused. “I was so pleased to see so many talented young players have the desire and the will to get three points in such trying circumstances. Things were conspiring against us for most of the game after we scored. 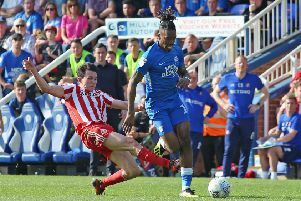 Posh full-back Michael Smith is about to collect his first yellow card at Chesterfield for a foul on Drew Talbot> Photo: Joe Dent/theposh.com. “We were fantastic at times. We dug deep and we showed a hunger, a real appetite to get make sure we took the three points home. We were resilient, but we also showed terific organisation. “That was far from an easy three points today, but sometimes your pure ability gets you home and sometimes winning is down to your character. It’s very encouraging that we have both. “We started the day in 10th place and that’s nowhere near where we want to be. We’re still talking promotion rather than the play-offs, but we have an awful lot to do. We have an awful lot of winning to do that’s for sure. Posh remain 12 points off the automatic promotion places with just 17 matches remaining. They host Bradford City at the ABAX Stadium in their next League One fixture on Saturday (February 13). Before then Posh have an FA Cup fourth round replay against West Brom at the ABAX on Wednesday (February 10). And Westley now has some defensive issues to sort out as right-back Smith and centre-back Santos will both be suspended for the tie following their red cards today. Central defender Jack Baldwin missed today’s game with a back injury that probably won’t clear up in time for him to face West Brom. Centre-back Gaby Zakuani played the final 15 minutes today, but that was his first outing since November 7. “I have some planning to do,” Westley admitted. “The preparation for that game has already started. “I have to say I felt Michael and Ricardo were harshly treated today. I wouldn’t have sent them off, but then I’m not the referee. Sometimes the conditions have to be taken into account. “Jack Baldwin took a nasty kick to the back in the final minutes at West Brom last week. Back injuries can clear up overnight or they can take weeks to heal so we will have to monitor Jack carefully. Attacking midfielder Marcus Maddison was also absent today. He has been suffering from flu.